Is Winning All the Time a Great Thing ? legendary coach of the Green Bay Packers. That attitude has been adopted as sacred gospel by our society. At the conclusion of the most recent Super Bowl, Cam Newton the quarterback that led his team to great heights only to succumb in America’s favorite game, really was taken to task for not going all the way. This perspective manifests itself in many ways outside the football field. From the classroom to the playground, we have become all about winning. We are increasingly unforgiving about any setbacks and defeats. Indeed there is a major presidential candidate that has anchored his campaign on the notion of constant winning and that he can deliver uninterrupted winning. Putting aside the reality for a moment that this is even remotely possible, I would even further ask, Is winning all the time even desirable ? Is there something to learn from losing occasionally ? Are there any teachable moments that can emerge from a defeat ? All these questions appear to be unheard of in the alternate reality of presidential politics and beyond, but these are questions that beg to be asked. In fact, Jewish tradition enlightens us about the virtue in failure. No less an authority than King Solomon wrote that the righteous fall down seven times before rising up. Some have suggested that doesn't mean that the righteous rise despite falling 7 times, rather, it's the righteous that rise precisely because they stumbled on multiple occasions. That is not to suggest that a person should not aspire to win and be successful but when there is a stumbling block, it can be utilized as an opportunity to learn from for the future. In fact, there was an very interesting article called, 10 reasons Why C students are more successful after graduation, which among other things says that they understand that failure is a beautiful teacher. One of the ideas mentioned in the article, is that they are not perfectionists. This is why so many successful entrepreneurs struggled in school. 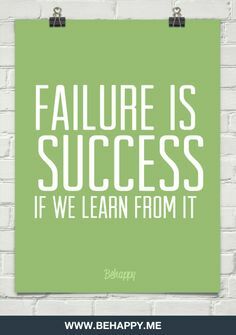 Learning to handle failure in (hopefully) small doses equips people for bigger challenges. It’s time to stop fantasizing about marrying the perfect person, having the perfect life and dare I say it, electing the perfect president. We live in an imperfect world with imperfect people and attaching ourselves to the notion of constantly winning is not only totally inconsistent with reality, it deprives us of the opportunity to grow from our failures.